But who is Caustic Candy? Talk to me…Tell me all about it. I don’t need much of an excuse to bob down to Bangkok for a weekend from Hong Kong. Who does when you have great shopping, awesome food and cheap massages just 2.5 hrs away? However, the excuse I’ve been using most for the past couple of years, is that when a movie I particularly want to see opens there before Hong Kong it is permissible for me to go to my favourite cinema to watch it – the wonderful Enigma Shadow Lounge in Siam Paragon. Now though, I have a new excuse: I have to go to Bangkok because I need to satisfy my addiction to David Thompson’s food. I ate in Nahm at the Halkin in London a few year’s ago and enjoyed it, but wasn’t blown away. However, having found out more about David Thompson since then and on discovering he’d be opening a restaurant in Bangkok, I had an inkling that with access to the full range of fresh indigenous ingredients, he might do wonders. After an abortive attempt to go to Nahm in early 2011, twice this year I’ve been to Bangkok, and twice I’ve flown earlier in the day so that I can get to Nahm for dinner. Yes, it’s one of the most expensive restaurants in Thailand, and yes it’s in a hotel (the Metropolitan), and yes, the chef is a farang, but by crikey he puts together some mouthwatering food! This guy has really nailed it. Now, we all know that the delight of eating in Thailand is that you can get the most wonderful food from the most humble of restaurants and food-stalls. But for a long time it’s been exasperating that there hasn’t been a really exciting restaurant in the capital pushing the envelope of Thai cuisine. The only difference between a good cheap restaurant and a good expensive restaurant was the decor, the wine list, and the lighting. Thompson is an Aussie who first visited Thailand some 20 years ago and moved there a year later after being utterly seduced by the place. He was very lucky to meet a lady called Sombat Janphetchara whose family worked in the palace, and who had somehow been taught the intricacies of palace cuisine. The basis of Thai cuisine is its pastes – the marrying together of the vast array of herbs, spices and aromatics in ideal proportions to produce the taste you want, is an art not a science. This is why you will see many of the same dishes on the menu in the north of Thailand as down in the south, but the flavours are very different because they use different ingredients in different proportions in their pastes. David Thompson seems to possess an extraordinary gift for creating wonderfully complex flavour profiles in his dishes that reveal themselves in stages through each mouthful, and it’s all because of Sombat Janphetchara teaching him how to use herbs and aromatics with extreme care, presence of mind and unending patience. And that’s it really. That’s what makes eating his food a startling pleasure. I don’t think I’ve eaten a meal where I’ve wanted to concentrate on each mouthful as much as I have at Nahm. The best chefs in the world almost universally place a number of different elements on a plate that together create a balanced flavour profile for the dish. You pick a little of this, with a little of that and a bit of another to put on your fork to eat, or you have to eat the different elements in turn in a suggested order to experience the flavour that the chef wants to impart. Not so with David Thompson’s food. The most you will have is a dip, the rest of that flavour profile is just sitting there in the bowl or the plate, innate in the curry, the salad or the parcel before you. That’s the clever part. That’s the magic. There’s not much point in going into details about the restaurant’s styling. You come here for the food not for the very standard, could-be-anywhere-hotel-breakfast-room decoration. The ambience can often be rowdy. There are many people who dine here for celebrations and it can get rather noisy on weekend nights, so ideally I’d suggest going on a weekday. The initial front of house service can be maddening. Once the food starts arriving it’s been absolutely fine, but to begin with you can easily be forgotten. Stay on the waiters if you feel you have been overlooked just once, and persevere as the food is worth it. There are some intense flavours in the menu and to get the best out of the meal make sure that you choose dishes that will balance each other. We were so excited the first time we ate at Nahm that we ordered a lot of the more unusual, pungent and rampantly hot items, and ended up a little overwhelmed by the flavour punches, (there is no manipulation of heat here; if a dish should be fierce with chilli, then fierce it shall be). The second time we went we chose more carefully and created a more satisfying overall meal, rather than just opting to try as many new things as possible. There is one starter that absolutely no one should go without and sets the tone for the rest of the meal, and that’s the grilled mussel skewers. There’s a good list of interesting cocktails and a very adequate wine list. I’m used to just plumping for beer with most Asian cuisine, but the sommelier was informed and helpful and we ended up with a Thai wine from Monsoon Valley, which was very decent. You can eat à la carte or opt for a menu that gives you the option of choosing one dish from each of the sections – a relish, a salad, a soup, a curry and a stir fry along with a taster of every one of the starters. This menu costs 1700THB++ (US$55) per person which is a complete bargain in my book, but drinks prices are up there with every other 5* hotel in Bangkok, so it can add up. Overall I think Nahm is great value given the quality of the food. Ground Floor, The Metropolitan Hotel, Sathorn Tai, Bangkok. Tel: 02-625 3333. It’s next to the Banyan Tree, so if it’s your first time in Bangkok go to Vertigo before or after for drinks. 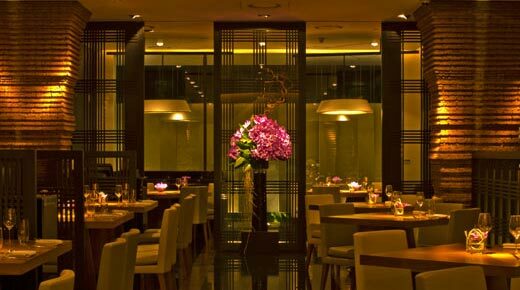 Ignore the service and the decor, insist on a table in a quiet corner when booking and concentrate on the food. I have no hesitation in saying that Nahm, without doubt, serves the best food in Bangkok at this point in time, and it’s because of David Thompson’s intense passion and deep respect for his adopted home’s food and culture. I am glad I am not the only one with an addiction to David Thompson’s food. I used to frequent the Nahm in London, sadly closed just before Christmas 2012, far more often than is strictly necessary. The restaurant manager told me of several occasions I was their most frequent customer, although whether that was really true or not I don’t know. Indeed I was so distraught by the closure, that a week after the closure I flew to Bangkok for the weekend from London just to get a couple of fixes in. And the missus an I are going again barely three months later.